As jurisdictions have moved into the implementation stage, some questions of interpretation have arisen. In the interests of consistent implementation and certainty for both tax administrations and taxpayers, the Inclusive Framework on BEPS has issued guidance to address certain key questions. This guidance is periodically updated. One of the conditions for receiving and using CbC Reports is that a jurisdiction must have in place the necessary framework and infrastructure to ensure the appropriate use of CbCR information. 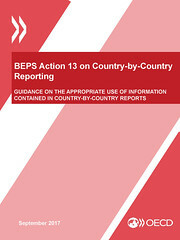 To assist jurisdictions in complying with this condition, the OECD has released guidance on the meaning of "appropriate use", the consequences of non-compliance with the appropriate use condition and approaches that may be used by tax authorities to ensure the appropriate use of CbCR information.